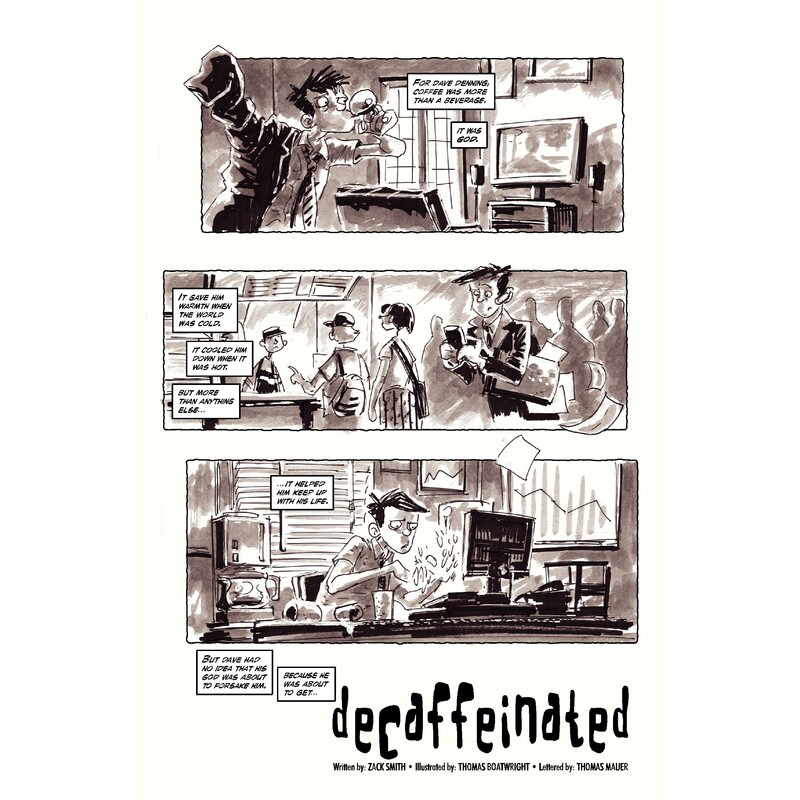 My recent giving-up of soda and most sugars has reminded me of this short story I did with artist Thomas Boatwright for a local anthology of coffee-themed comics a few years back. 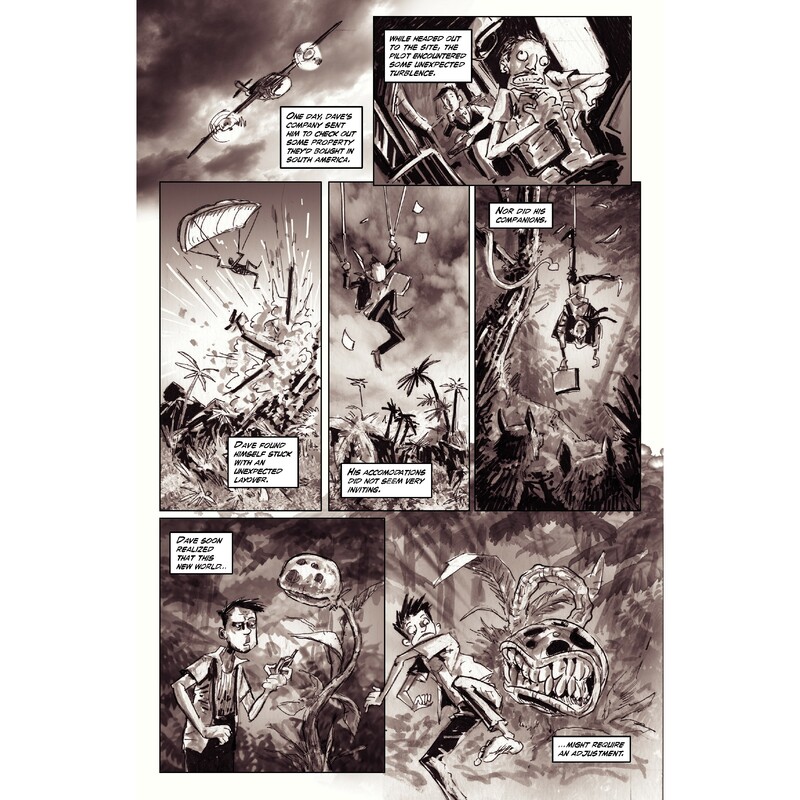 Here’s the tale for free — a little rushed by me at the end (page limit!) but I think it still has some charm and the art is ROCK. Click on the pages for larger versions. 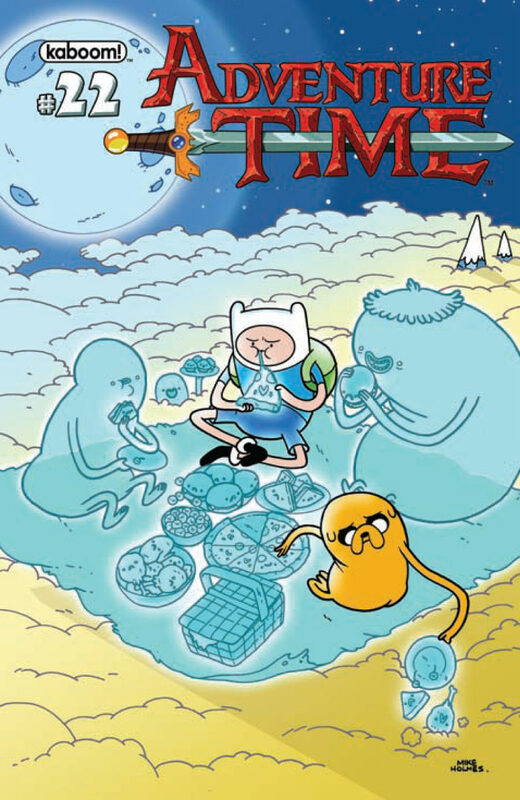 ADVENTURE TIME: “Grocery Time” Pt.2 is Out! Comments Off on ADVENTURE TIME: “Grocery Time” Pt.2 is Out! 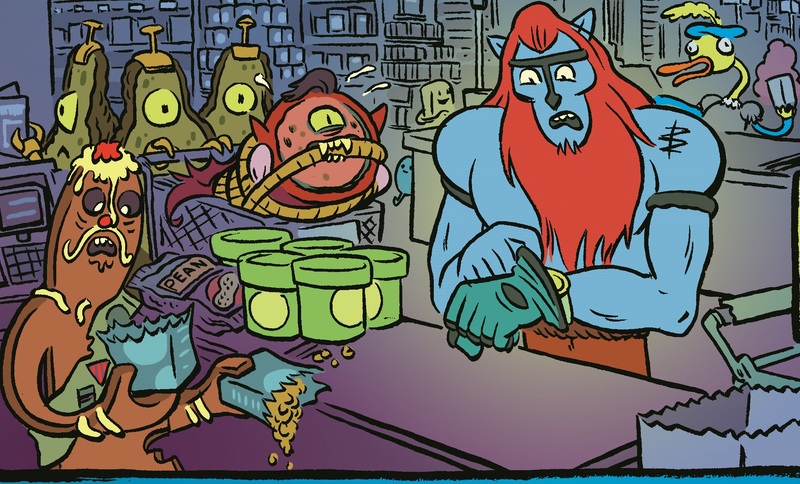 The conclusion to my ADVENTURE TIME story with artist Brad McGinty, “Grocery Time,” is out in stores this week in ADVENTURE TIME #22! 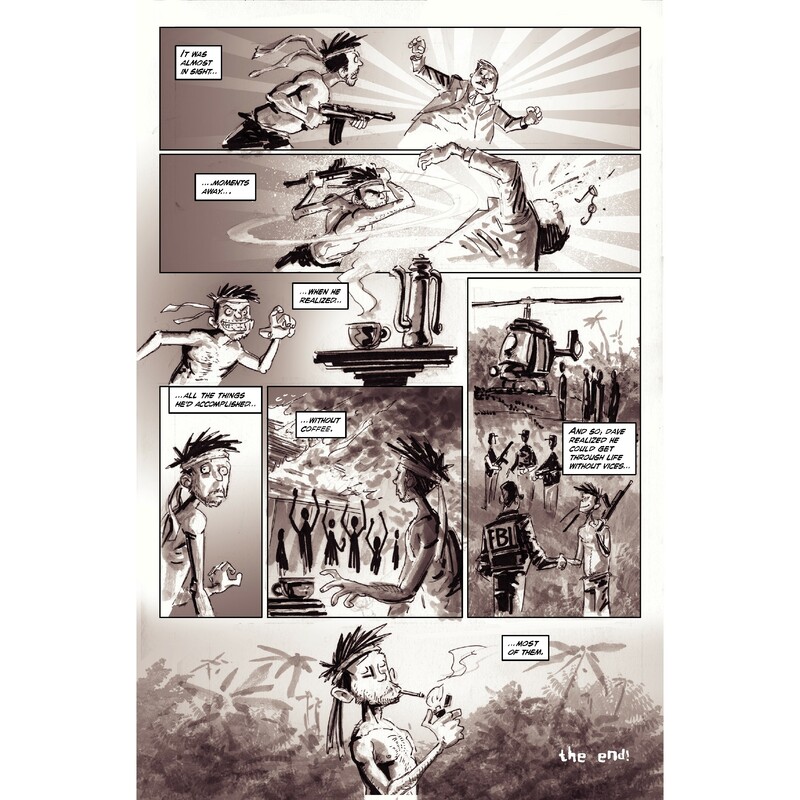 You can buy an e-copy on ComiXology here. 1) Yes, Part One ran two months ago in issue #20. No, I don’t know why it didn’t run on consecutive months. The story WAS finished when we turned it in, but there are a limited number of pages for backups and it can be very tricky to figure out how to use the space. I appreciate KaBOOM! letting us do this story and have no ill will over this. 2) No, I probably won’t be doing more AT stories in the future. KaBOOM! has made it clear they have a large number of writers and artists doing such tales and don’t have room for more material at this time. I have some more pitches to them being considered by Cartoon Network for approval, but it could be a while before there’s room for any of them. Again, it was a great opportunity and I have no bad feelings — it’s just how the business works. 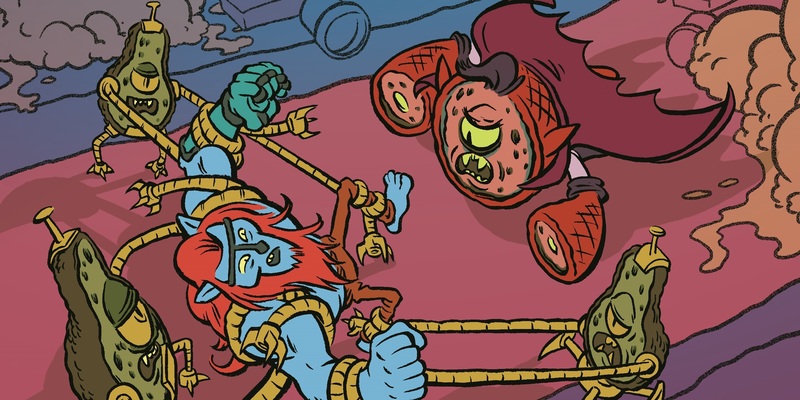 Additionally, Brad McGinty ALSO has a story in REGULAR SHOW #6, which is out today. He is a brilliant, brilliant artist and we’re working on a creator-owned miniseries pitch for another publisher. At this point, I’m trying to deliver a polished full script for the first issue along with a full miniseries pitch, and Brad’s finishing up a few other projects before doing character designs, so it’s going to be a while before it can even be CONSIDERED for publication. But I truly hope to get this or another project together, not just for the career boost (no shame in my game), but for the excitement of seeing my weird ideas being brought to con’sid’ra’ble life by Brad’s Brobdingnaggian talents (look it up, I was tired of saying “Herculean”). A few notes on the story, though this is more of a “What NOT to do” when writing a script. 1) Out of all the pitches I sent KaBOOM!/Cartoon Network, this was the one they took, and once I sat down to write it, I realized I’d hosed myself, as I had to introduce new characters, new settings, a plot with a beginning/middle/end AND an action sequence in a mere seven pages (they gave me eight, bless them). So is this story rushed, and did I take a few shortcuts? You bet your bippy I did. 2) So first, it was great fun writing the fight sequence. Fight/action scenes are just about trying to find unique ways for the characters to act and react, and Brad did a very fun job pitting Billy against the Ham-Pire. I had fun thinking of things the Ham-Pire could do, but I wish I’d thought of more unique ways for Billy to fight back using the materials of the Grocery Kingdom. 3) I also feel great, great shame for resorting to the cheapest dues ex machina in the book — the hero finds a MAGICAL REMOTE CONTROL to take over the evil robots. Now, if you read both parts of the story in one sitting, I did try to establish this back on Pg.3 by introducing the cereal box display, but man, I wish I’d thought of something better to get to the denouement. I ran this by a number of friends, including a few cartoonist who work on ADVENTURE TIME, and they said to stop worrying, but I NEVER STOP WORRYING. 4) In a random bit, the Royal Tart Toter is a check-out clerk in the Grocery Kingdom, because I keep encountering tragically old, sometimes demented old people as greeters at big-box stores whenever I go there. Brad wanted a few more clerks for the background, so we went with the Squeez-E-Mart clerk and Choose Goose, who presumably had a slow season in his trading business or needed health insurance. 6) So the story ends with the revelation that it’s a tale being read to Baby Finn and Baby Jake by Joshua the Dog-Dad. 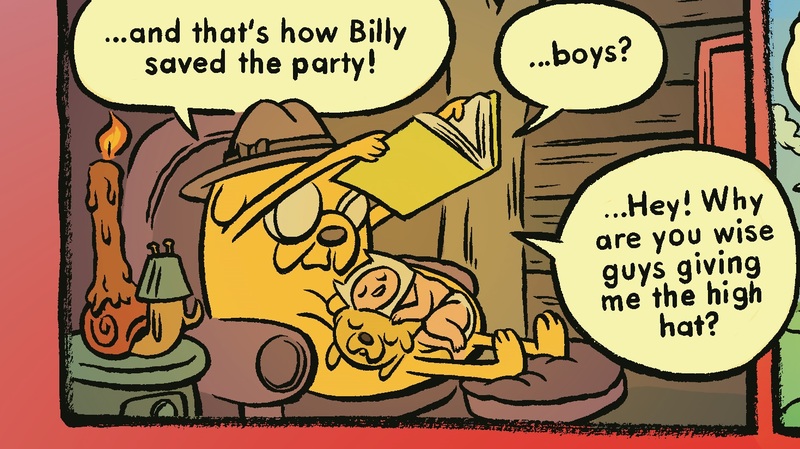 I wanted to do this to give the story a cute moment amidst all the silliness and propose an addition to the show’s mythology — Finn and Jake learned about Billy because Joshua read them stories as kids, and this probably helped inspire them to grow up to be heroes themselves. Acknowledging the page was already cramped in the script, I initially wrote this scene as optional, but regular AT comic writer Ryan North said that as the writer, I should say whether something was in the story or not, and that the scene was good and deserved to be in there. I still like it, but wish that I’d found a way to give it more room to breathe and sink in. I did like having a nice, placid moment to end all the craziness of the story. Brad wanted an extra panel to contain Joshua’s final rant and suggested an exterior shot of the house. In the episode “Memory of a Memory,” Finn’s childhood home is depicted as a different place, but there’s no exterior shots of it. We figured that since “Dad’s Dungeon” showed that Joshua had built a dungeon near the Tree Fort and hid a holo-viewer in its attic, perhaps the Dog family had moved there or leased it from previous owner Marceline (that’d be a fun story to tell). It’s a cheat, but the story does play fast and loose with AT mythology in the interest of including cameos anyway. So now you know…too much of the story. Hope you liked it, and hopefully I’ll have a few more comics finished in 2014, with both Brad and others among the Finest Artists Known to Man!